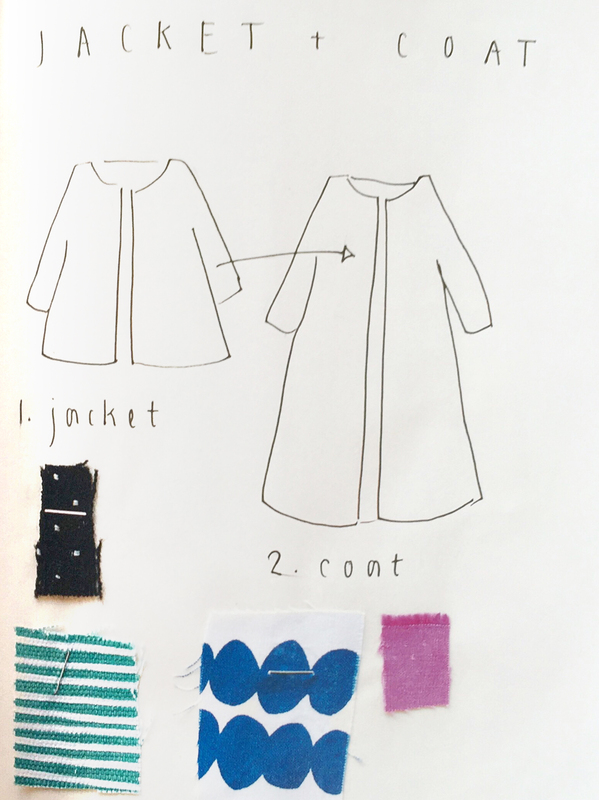 I have been humming and hawing about which pattern to use for my spring coat, or whether to draft my own. Right now, I’m enjoying exploring all the indie pattern companies, so I decided to try that path first. 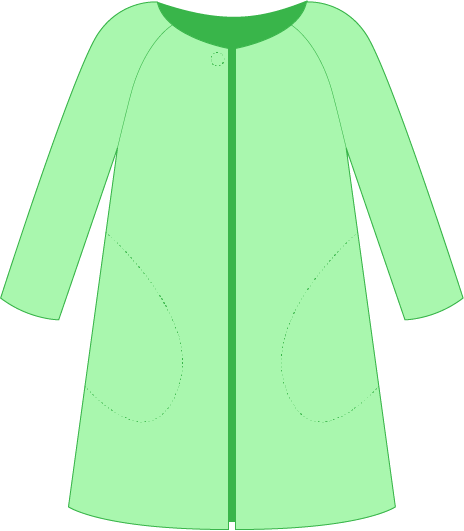 I have a few in mind but I thought I would start with trying a muslin of the coat from Everyday Style Lotta Jansdotter. This is the sketch that is in the book. It’s not very detailed. Below, is my line drawing from the photos and illustrations. I haven’t looked at the actual pattern, so I don’t know for sure that this is the right amount of flare and so on, but at least we can see what kind of sleeves it has. Examining the book, she and her friend both model this same coat sample. Clearly, her friend is a little larger and the coat doesn’t fit quite as well. It’s showing some strain around the upper arms and it looks as though it would be tight over the bust, if closed. 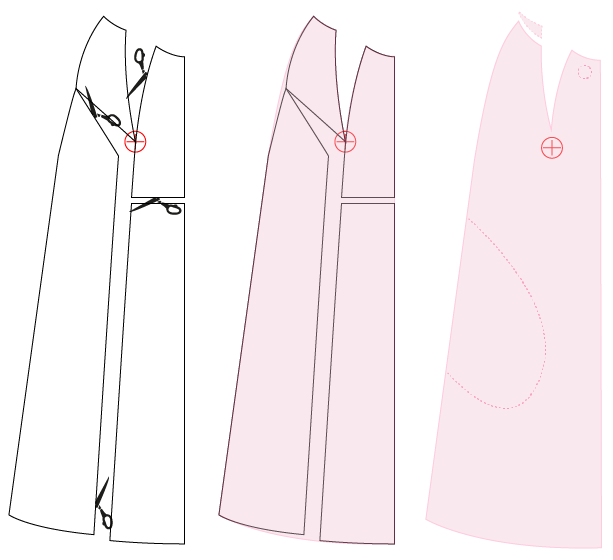 I will use the largest size to make my muslin, and then add some bust width and a dart so that it can sit closed over my bust. I think the best place to for the dart is the neckline, echoing the raglan sleeve seam, like this. To do this, I will establish my bust point (the red circle with cross on my diagrams) and then slash up the lines as shown. I will open up the width by about 3cm (I’ll keep a note of how much I decide to use) and pivot open the neck dart. I will add extra length over my front as shown below and then tidy up and true all lines. The diagrams show only the front piece. I will need to copy these changes to my front facings but I won’t use those for the muslin. I’m aiming for the simplest coat possible. I need it to fit over a light cardigan. I will check the fit in my upper arm, but I don’t want it oversized in the shoulders. I may bring the front neck down a little and adjust the length to my mid-thigh. I should have some pictures of the muslin by Saturday. If I can get to Ikea I could have one of these cheap (£4-£8) fabrics for making a wearable muslin in. I love the clouds! Let’s hope I have more success with this pattern than the last. 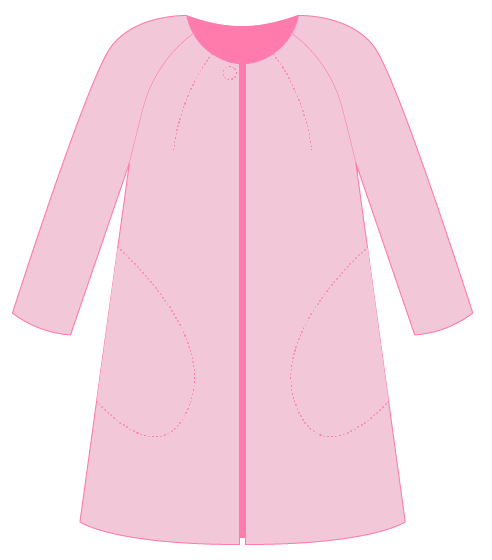 I’m planning a similar shaped coat for summer, so I appreciate your research – it saves me the work! Ikea is a good idea for cheap fabric and you never know if the muslin works out – you’ll have a very original coat. 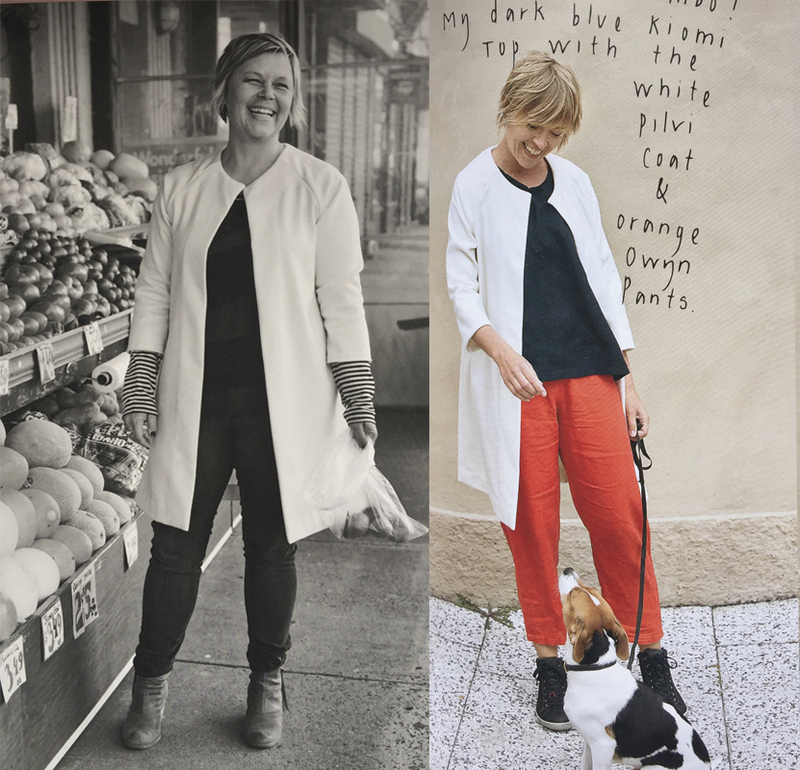 I’ve ordered the Strand coat pattern from Merchant and Mills too.